While standing at the bus station upon our arrival in Plovdiv, Bulgaria, a man approached me and gestured to my scuffed, worn boots implying that he wanted to shine them. I smiled politely and shook my head before returning to my conversation with Michael, where we were deliberating how best to get to our hostel. To my bemusement, the man didn’t leave but had returned my smile with one even larger and began to rummage through his shoe shine supplies. I looked him in the eye and shook my head more forcefully this time, but the man did not let up. His grin growing wider still, he beckoned me to sit, obviously believing that he was going to make a bit of cash. I shook my head once more and tried to walk away, only to realise that the man was following with a perplexed look on his face. That’s when it hit me. I faced him and, trying to look as apologetic as possible, vehemently nodded my head while pointing to my boots and his supplies. Understanding that I didn’t want my shoes shined, the man left me with Michael and proceeded to try and sell his services elsewhere. A word of explanation: in Bulgaria, a head shake means “no” and a nod means “yes.” This was something that I had read about, but had not yet encountered and, frankly, after five days in Sofia, had forgotten about entirely. I’ve said it before, but I tend to feel that if one really wants to get to know a country, he must venture outside of its capital city. Because, on thinking about it, how Bulgarian is Sofia? How Hungarian is Budapest? How British is London? Plovdiv is considered to be the oldest city in Europe to have been continuously inhabited. The ancient city, first known as Philippopolis, was originally settled by Thracian tribes around 6,000 BCE. This is instantly obvious–where the confluence old and new impressed me in Sofia, Plovdiv reciprocated ten-fold. As the second-largest city in Bulgaria, gazing at the sprawling metropolis atop the ruined fortress is nothing short of amazing. Ancient fixtures seem to mix effortlessly with the modern amenities of the twenty-first century city. Nothing exemplifies this more than the massive Thracian amphitheatre, a fixture of the city centre. A walk here through the cobbled streets of the old town is not for the weak-ankled, but seeing this impressive colosseum in the midst of contemporary shops cafes is astonishing. In the summer months, the largest part of the amphitheatre is still used to host events like concerts and open-air theatre. It is so excellently well-preserved that it puts more on-the-map ruins to shame and, coupled with the lack of tourist crowds, visiting is truly a joy. 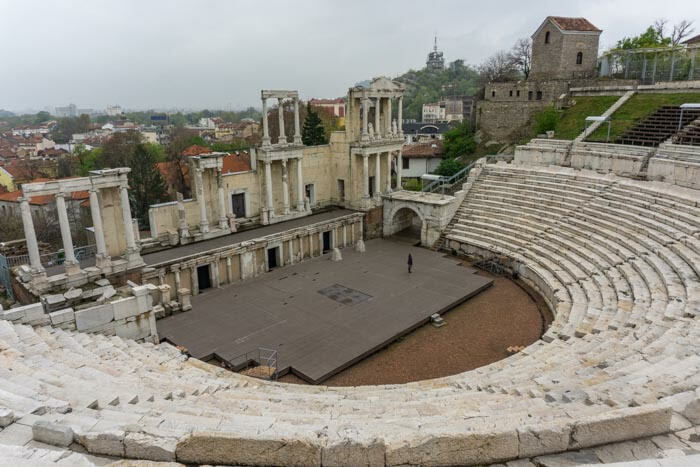 Plovdiv is more, though than just ancient ruins. We were met with some of the famous hospitality that had become synonymous with the Balkans. When we checked into our hostel, Hostel Old Plovdiv, we were greeted with a personalised sign welcoming us on an Australian flag (Michael made the booking). On top of that, we were provided with a complimentary bottle of some exceptional Bulgarian sparkling wine (did I mention that Plovdiv is in the heart of Bulgaria’s world-class wine country?) and lavender sachets on our pillows! Plovdiv also offers an excellent cafe and restaurant culture. Strolling through the streets of the trendy neighbourhood known as “the Trap” we encountered some great Bulgarian cuisine in some quirky bars and eateries. An order of tarator soup prompted an older local man to express his satisfaction that we, as tourists, were enjoying the local fare. Plovdiv was a joy to visit. It is a busy city with a thriving culture, fascinating history, and incredibly friendly people. It was definitely a highlight of our travels through Bulgaria and I’m sure that we’ll return one day. Have you been to Plovdiv? What was your experience? Leave a comment below!